Elucidation of the biochemical pathways involved in activation of preterm and term human labour would facilitate the development of effective management and inform judgements regarding the necessity for preterm tocolysis and post-term induction. Prostaglandins act at all stages of human reproduction, and are potentially activators of labour. 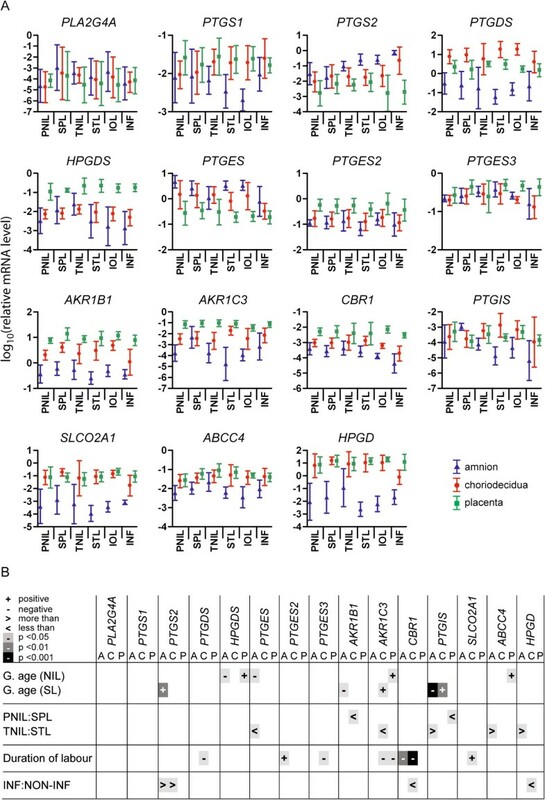 Expression of 15 genes involved in prostaglandin synthesis, transport and degradation was measured by qPCR using tissue samples from human placenta, amnion and choriodecidua at preterm and full-term vaginal and caesarean delivery. Cellular localisation of eight prostaglandin pathway proteins was determined by immunohistochemistry. Expression of prostaglandin pathway genes was differentially affected by factors including gestational age at delivery, and the incidence and duration of labour. Chorioamnionitis/deciduitis was associated with upregulation of PTGS2 (prostaglandin-endoperoxide synthase 2 (prostaglandin G/H synthase and cyclooxygenase)), along with the inflammatory genes IL8 (interleukin 8), S100A8 (S100 calcium binding protein A8) and TLR2 (toll-like receptor 2), in amnion and choriodecidua, and with downregulation of CBR1 (carbonyl reductase 1) and HPGD (hydroxyprostaglandin dehydrogenase 15-(NAD)) in choriodecidua. Protein localisation differed greatly between the various maternal and fetal cell types. Preterm and term labour are associated with distinct prostaglandin pathway expression profiles; inflammation provokes specific changes, unrelated to the presence of labour; spontaneous and induced term labour are indistinguishable. Human labour requires a dramatic transition from a state of uterine quiescence and immune tolerance of the fetus—that prevails throughout pregnancy—to a brief period of intense uterine activation involving connective tissue remodelling and coordinated smooth muscle activity. The signals that initiate this process are not yet known, but among the candidates are the prostaglandins, which are known regulators of many aspects of reproductive physiology [1, 2]. Evidence suggests that, during uterine activation there is positive feedback between prostaglandins and inflammatory cytokines that are released by infiltrating leukocytes . Our early studies demonstrated that there is a relationship between inflammatory infiltration of the placenta, fetal membranes and decidua and increased prostaglandin and leukotriene release [4, 5]. Inflammation has been associated with initiation of term and preterm labour both in the presence and absence of observable infection [6–12]. It is therefore possible that prostaglandins and inflammatory pathways are involved in uterine activation. It is important to establish the interactions between these pathways, both for women at risk of preterm birth who may be treated with anti-inflammatory drugs and prostaglandin synthesis inhibitors, and for women facing post-term induction of labour involving prostaglandin treatment. We previously compared the relative levels of expression of 15 genes acting in all stages of prostaglandin metabolism (their relationships are illustrated in Figure 1) in human uterine tissues , demonstrating specific capacities for synthesis and catabolism of PGD2, PGE2, PGF2 and PGI2 in each tissue. We have now made a detailed examination of these genes in samples of placenta, choriodecidua and amnion, demonstrating that factors such as gestational age and the incidence and duration of labour are associated with significant changes in expression patterns. We have also characterised the distribution of prostaglandin pathway proteins throughout the constituent cells of the uterus using immunohistochemistry. Cellular pathways of prostaglandin (PG) metabolism. A cell is depicted, showing enzymatic components (coloured boxes) involved in precursor prostaglandin synthesis, terminal prostaglandin synthesis, prostaglandin transport and prostaglandin inactivation, with reactions (thin arrows) and products (open circles). We have found distinct uterine prostaglandin gene expression and immunolocalisation in the presence of inflammation, suggesting uterine activation occurring through increased PTGS2 expression in the fetal membranes and decreased degradative HPGD in the choriodecidua. Expression patterns in spontaneous preterm and term labour without inflammation differed from each other and from those with inflammatory changes. There were no differences between spontaneous and induced labour at term. All women gave written informed consent according to the requirements of the North Somerset and South Bristol Research Ethics Committee. Placenta and gestational membranes were collected immediately post-partum from the following groups of women: preterm (25–36 weeks gestation) not-in-labour (PNIL), delivery by caesarean section for maternal or fetal complications; spontaneous preterm labour (SPL), with vaginal delivery; term (≥ 37 weeks gestation) not-in-labour (TNIL), delivery by elective caesarean section indicated by previous section and/or breech presentation; spontaneous term labour (STL), with vaginal delivery; term following induction of labour (IOL) with intravaginal PGE2 pessary and/or intravenous oxytocin infusion, with delivery vaginally or by emergency caesarean section (failure to progress). The women were of mixed parity and all delivered live singletons. None of the women in preterm labour received steroid treatment. Tissues were also collected from a group of women (INF) with evidence of inflammation, as suggested by clinical features of the women (pyrexia or uterine tenderness) and gross pathology of the delivered placentas, and confirmed histologically by the presence of leucocyte infiltration in the fetal membranes (chorioamnionitis), decidua (deciduitis) or placenta (intervillositis), with or without maternal pyrexia or uterine tenderness . Clinical information for the women providing uterine tissues for this study is given in Table 1. Tissues from 36 women were used in this study; tissues from 31 of these women were previously among those used to study overall levels of prostaglandin pathway gene expression in placenta and gestational membranes . Myometrial tissues used in the previous study were taken from a separate group of women. Gestational membranes were dissected from between 1 cm and 4 cm from the placental border. Placental tissue was dissected from > 5 mm beneath the maternal surface of the placenta. Tissue samples were dissected immediately after delivery (amnion and choriodecidua were separated by blunt dissection), washed in sterile phosphate-buffered saline (PBS), snap-frozen and stored in liquid nitrogen. Tissues were also fixed and paraffin-embedded following standard procedures for immunohistochemistry. Values are mean, mean ± standard deviation, or relative numbers in two groups. Abbreviations: ARMassisted rupture of the membranes, INFinflammation, IOL induction of labour, PNIL preterm not-in-labour, SPL spontaneous preterm labour, SRM spontaneous rupture of the membranes, STL spontaneous term labour, TNIL term not-in-labour. Total RNA was extracted from 100 mg tissue samples by the guanidine isothiocyanate/phenol method using 1 ml TRIzol (Invitrogen, Carlsbad, CA, US), giving yields of 10–150 μg. RNA was quantified using a GeneQuant II spectrophotometer (GE Healthcare, Little Chalfont, UK). 2 μg total RNA was used as a template for cDNA synthesis primed by random primers using the High Capacity cDNA Reverse Transcription Kit (Applied Biosystems, Foster City, CA, US). cDNA was diluted fourfold and 2 μl used as template for qPCR with the Power SYBR Green PCR Master Mix (Applied Biosystems), with reaction volume of 20 μl, forward and reverse primer concentrations of 75 nM, and 45 cycles of 95 C for 15 s and 60 C for 60 s, followed by a dissociation stage, using a 7500 Real-Time PCR System (Applied Biosystems). Two genes with least Ct variability, POLR2A (polymerase (RNA) II (DNA directed) polypeptide A, 220 kDa) and ARHGDIA (Rho GDP dissociation inhibitor (GDI) alpha), were chosen from five candidates for use as endogenous controls. PCR reaction efficiencies for all primer pairs were tested by serial template dilution, and were between 90% and 110%. The ‘sample maximization’ method was used, with reactions for each gene run on the minimum number of plates. A standard set of inter-run calibrators was included on each plate. Analysis was as previously described . Sequences for all primers used in this study are given in Table 2. Sequences written 5’-3’, with corresponding position of 5’-terminal nucleotide in mRNA indicated in parentheses. All sequences are from GenBank at NCBI. Slide-mounted, paraffin-embedded tissue sections were dewaxed in Histoclear (National Diagnostics, Atlanta, GA), hydrated in a graded ethanol series (absolute, 90%, 70% ethanol) and incubated in 1% (w/w) aqueous hydrogen peroxide solution for 15 min to block endogenous peroxidase activity. Antigen retrieval was achieved by incubation in citrate buffer (10 mM sodium citrate, pH6.0, 0.05% (v/v) Tween-20) at 95°C for 20 min. Slides were incubated for 20 min with 2% (v/v) blocking serum, washed with PBS and incubated overnight with primary antibody at the following dilutions: PTGS1 (prostaglandin-endoperoxide synthase 1 (prostaglandin G/H synthase and cyclooxygenase)) 1:60 (sc-1752, Santa Cruz Biotechnology, Santa Cruz, CA); PTGS2 1:60 (sc-1745); AKR1B1 (aldo-keto reductase family 1, member B1 (aldose reductase)) 1:200 (in house, Fortier MA); AKR1C3 (aldo-keto reductase family 1, member C3) 1:200 (ab27491, Abcam, Cambridge, UK); CBR1 1:300 (ab4148); PTGES (prostaglandin E synthase) 1:200 (160140, Cayman Europe, Tallinn, Estonia); HPGD 1:300 (in house, Fortier MA); SLCO2A1 (solute carrier organic anion transporter family, member 2A1) 1:3500 (in house, Fortier MA); VIM (vimentin) 1:200/1:1000 (V4630, Sigma, Gillingham, UK/M7020, DAKO, Ely, UK) in PBS + 3% (w/v) BSA. Slides were washed three times in PBS then incubated for 2 h with biotinylated secondary antibody (Vectastain ABC signal enhancement kit, Vector Labs, Burlingame, CA) diluted 1:200 in PBS + 3% (w/v) BSA. Slides were washed with PBS and incubated for 30 min with Vectastain ABC streptavidin-HRP (horseradish peroxidase) conjugate, washed again and incubated with 3,3’-Diaminobenzidine (DAB, Sigma) for antibody-specific colour development, which was stopped by washing in PBS, before counterstaining nuclei with Mayer’s Haemalum, dehydrating in a graded ethanol series followed by Histoclear and finally coverslip mounting using DPX mountant. Associations between levels of gene expression and continuous clinical variables (maternal and gestational age, duration of labour) were determined by measuring the probability of significance associated with the Pearson correlation coefficient (using the TDIST function in Excel). Comparisons of expression levels in distinct subgroups of subjects were made in Excel with Student’s t-tests (two-way, not assuming equal variances or equal sample size). We investigated the possibility of relationships between clinical features of the subjects and prostaglandin gene expression levels in uterine tissues. Significant correlation between gestational age at delivery and prostaglandin gene expression occurred with gene and tissue specificity, as shown in Figure 2. In women who were not in labour at delivery, there was a negative correlation (decreasing gene expression with increasing gestational age) for PTGES in amnion (p = 0.045), and positive correlation for HPGDS (hematopoietic prostaglandin D synthase) in amnion (p = 0.039), HPGDS, AKR1C3 and ABCC4 in placenta (p = 0.020, 0.024, 0.046). In women delivering following spontaneous labour, there was negative correlation for AKR1B1 and PTGIS (prostaglandin I2 (prostacyclin) synthase) in amnion (p = 0.049, < 0.001), and positive correlation for PTGS2 in amnion (p = 0.007) and AKR1C3 and PTGIS in choriodecidua (p = 0.026, 0.022). In these women, as expected, gestational age showed a strong positive correlation with birth weight (p < 0.001). Expression of prostaglandin pathway genes in pregnant human uterine tissues. (A) Relative levels of mRNA by ΔΔCt method following qPCR, log10-transformed, shown as mean ± SD. A, amnion (blue); C, choriodecidua (red); P, placenta (green). PNIL, preterm not-in-labour; SPL, spontaneous preterm labour; TNIL, term not-in-labour; STL, spontaneous term labour; IOL, induction of labour; INF, inflammation. Numbers of samples: PNIL = 4; SPL = 4; TNIL = 6; STL = 5; IOL = 5; INF = 4. (B) Statistical comparisons of gene expression. Relationships with gestational age (g. age) in combined not-in-labour (NIL = PNIL + TNIL) and spontaneous labour (SL = SPL + STL) groups, and with duration of labour (SPL + STL + IOL) tested by correlation (Pearson’s); level of significance and direction of correlation are indicated. Comparisons between the presence and absence of labour (preterm and term) and inflammation were tested by Student’s t-tests. Gene expression was compared between groups of women matched for gestational age who delivered with or without spontaneous labour. With preterm deliveries, expression was higher with labour for AKR1B1 in choriodecidua and PTGIS in placenta (p = 0.032, 0.028). With term deliveries, expression was higher with labour for PTGES in amnion and AKR1C3 in choriodecidua (p = 0.045, 0.033), while levels of PTGIS, ABCC4 and HPGD in amnion were higher in deliveries without labour (p = 0.043, 0.049, 0.038). Duration of labour in spontaneous and induced labour deliveries ranged from 33 minutes to 17 hours. Pearson correlation coefficients were calculated to determine the association between duration of labour and gene expression. Negative correlation, indicating decreasing expression with increasing duration, was seen with expression of CBR1 in amnion (p = 0.006), PTGDS (prostaglandin D2 synthase 21 kDa (brain)), PTGES3 (prostaglandin E synthase 3 (cytosolic)), AKR1C3 and CBR1 in choriodecidua (p = 0.049, 0.011, 0.013, <0.001) and AKR1C3 in placenta (p = 0.031). Positive correlation was seen for PTGES2 (prostaglandin E synthase 2) in amnion (p = 0.022) and SLCO2A1 in choriodecidua (p = 0.010). Placenta and gestational membranes were collected from women with uterine inflammation, and PG gene expression in this group was compared by t-test with expression in a subgroup of women with no inflammation that was matched for gestational age and mode of delivery (Figure 2). Effects of inflammation were limited to upregulation of PTGS2 in amnion and choriodecidua (p = 0.022, 0.038), and downregulation of CBR1 and HPGD in choriodecidua (p = 0.018, 0.011). 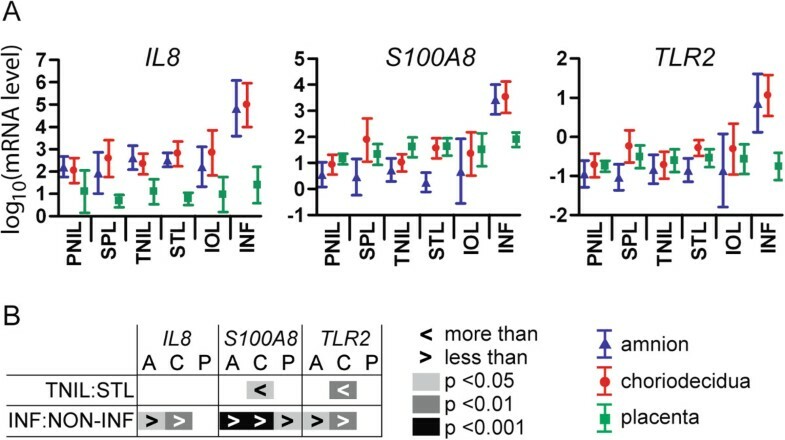 Women were assigned to the inflammation group on the basis of established histological criteria , and we further characterised the inflammatory status of all tissue samples by measurement of the expression of three genes known to be involved in inflammatory responses: IL8, S100A8 and TLR2 (Figure 3). All three genes were significantly upregulated in both amnion (p = 0.021, < 0.001, 0.012) and choriodecidua (p = 0.002, <0.001, 0.002) from women assigned to the inflammation (INF) group. In placenta, the only change was an increase in S100A8 (p = 0.037) with inflammation. Both S100A8 and TLR2 were expressed at significantly higher levels in choriodecidua from women in the STL compared to the TNIL group (p = 0.014, 0.010) confirming a degree of inflammatory activity in term labour. Levels of both genes also appeared to be higher in SPL rather than PNIL choriodecidua, but these differences were of borderline significance (p = 0.061, 0.057). 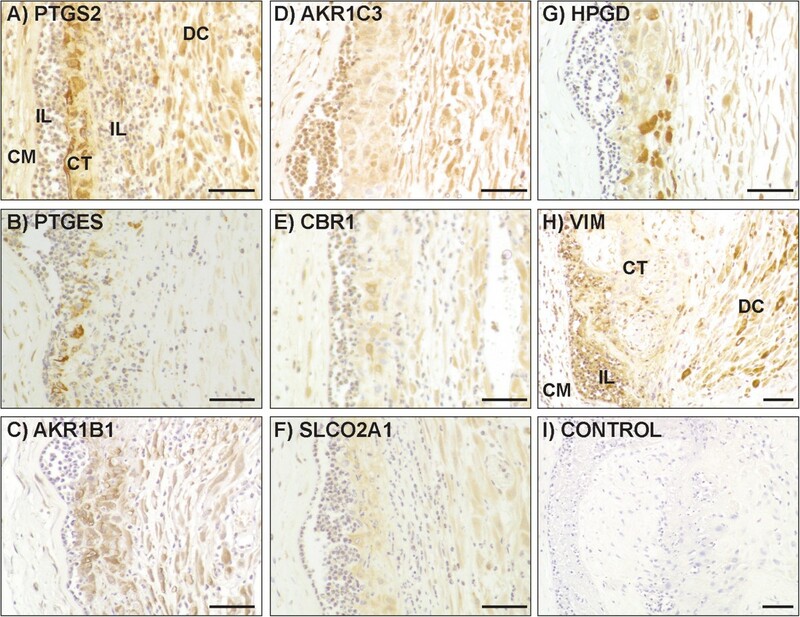 Expression of inflammatory genes in pregnant human uterine tissues. (A) Relative levels of mRNA by ΔΔCt method following qPCR, log10-transformed, shown as mean ± SD. PNIL, preterm not-in-labour; SPL, spontaneous preterm labour; TNIL, term not-in-labour; STL, spontaneous term labour; IOL, induction of labour; INF, inflammation. Numbers of samples: PNIL = 4; SPL = 4; TNIL = 6; STL = 5; IOL = 5; INF = 4. (B) Statistical comparisons of gene expression. No significant relationships were observed with gestational age in not-in-labour or spontaneous labour groups, between preterm and term not-in-labour or with duration of labour, so these comparisons are not shown. Comparisons of gene expression in the presence and absence of labour at term and of inflammation were tested by Student’s t-tests. Level of significance and direction of differential comparison are indicated. A, amnion; C, choriodecidua; P, placenta. Low magnification images of H&E-stained placental sections in Figure 4A show (i) the fetal trophoblastic villi and intervillous space, which make up the great majority of the placenta, and (ii) the basal plate, which lies adjacent to the uterine wall. Figure 4B-I show placental immunolocalisation of eight of the PG pathway proteins, while Figure 4J shows the localisation of vimentin in villous fibroblasts, vascular cells, macrophages and decidual cells, but not trophoblasts. Immunohistochemical localisation of PG pathway proteins in the placenta. (A) H&E-stained control indicating structure of (i) placental villi, interspersed with maternal blood (MB), (ii) basal plate, containing extravillous trophoblasts (EVT) and decidual cells (DC). (B-K) Higher magnification images of (i) placental villi, indicating syncytiotrophoblasts (ST), vascular cells (VC) and villous macrophages (VM), (ii) basal plate. (K) Negative control without addition of primary antibody. Scale bar = 50 μm. In the chorionic plate (the surface of the placenta adjacent to the amniotic cavity), the amnion epithelium showed staining for PTGS2 and PTGES (not shown). Extravillous cytotrophoblasts, which form an incomplete layer at the inner border of the chorionic plate, showed staining for HPGD, PTGES, SLCO2A1, AKR1B1, AKR1C3 and CBR1.In the placental villi (Figure 4A-K(i)), syncytiotrophoblasts displayed staining for AKR1B1, HPGD PTGS2, SLCO2A1, CBR1, AKR1C3, and PTGES. Villous fibroblasts showed PTGS2 and SLCO2A1 staining and heterogeneous AKR1B1 staining. Villous macrophages were positive for PTGS1 and PTGES. The basal plate of the placenta (Figure 4A-K(ii)) consists of maternal decidual cells and fetal extravillous cytotrophoblasts, in some areas arranged in distinct layers and in others partially or thoroughly interspersed. Both decidual cells and extravillous cytotrophoblasts showed staining for AKR1B1, PTGS2, HPGD, PTGES, SLCO2A1, AKR1C3, and CBR1. 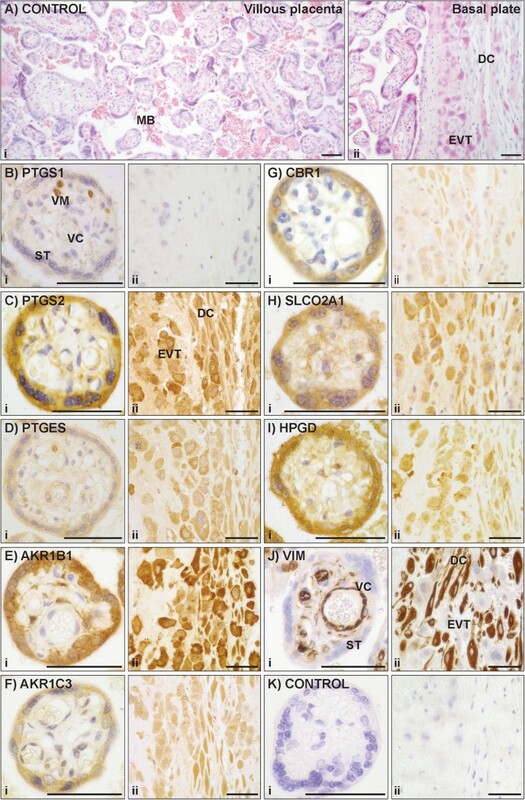 Staining in the two cell types varied from patient to patient and even in different regions of the same placental tissue section, notably with PTGES and HPGD in extravillous cytotrophoblasts. Extravillous cytotrophoblasts clustered in cell islands in the villous placenta had similar staining patterns (not shown). There was no noticeable staining for any of these proteins in fibrinoids of the basal plate (not shown). Protein distribution in the placental cell populations is summarised in Table 3, along with references to previous descriptions of these proteins. Protein immunolocalisation identified in this study is represented by shaded cells; previous observations are referenced. Abbreviations: AE amniotic epithelium, AF amniotic fibroblasts, CF chorionic fibroblasts, CT chorionic trophoblasts, DC decidual cells, EVT extravillous trophoblasts, IL infiltrating leukocytes, ST syncytiotrophoblasts, VC vascular cells, VF villous fibroblasts, VM villous macrophages. Figure 5A-G shows the immunolocalisation of seven of the PG pathway proteins in amnion and choriodecidua (PTGS1 is not included as we observed no staining in these tissues); Figure 5H shows vimentin localisation in decidual cells, amnion epithelium and fibroblasts of the amnion and chorion, but not in chorionic trophoblasts. In each panel a lower magnification image (i) gives a view through a full section of the membranes, while higher magnification images show (ii) decidual cells, (iii) chorionic trophoblasts and chorionic fibroblasts, (iv) amniotic epithelium. Immunohistochemical localisation of PG pathway proteins in the gestational membranes. (A-I(i)) Lower magnification images show full thickness of membranes, containing amnion epithelium (AE), amnion fibroblasts (AF), chorionic fibroblasts (CF), chorionic trophoblast (CT) and decidual cells (DC). Higher magnification images show (ii) DC, (iii) CT, CF, (iv) AE. (I) Negative control without addition of primary antibody. Scale bar = 50 μm. The decidual cells showed staining for AKR1B1, HPGD, AKR1C3, PTGS2, SLCO2A1 and CBR1. Chorionic trophoblasts had staining for HPGD, AKR1B1, CBR1, PTGS2, PTGES, AKR1C3 and SLCO2A1. AKR1B1, PTGS2, AKR1C3, HPGD and CBR1 were seen in amniotic and chorionic fibroblasts. PTGS2 and PTGES had immunological reactions in amniotic epithelium. This protein distribution is summarised in Table 3. Inflammation results in disruption of the fetal membranes, with highly variable leukocytic infiltration and loss of integrity of the chorionic trophoblast layer. Within a tissue section it is common to see regions of massive infiltration with minimal remaining chorionic trophoblasts, alongside sections of membrane that appear relatively normal. Figure 6 shows immunolocalisation of prostaglandin proteins in membranes with a moderate inflammatory reaction, with considerable leukocytic infiltration but a relatively undiminished chorion. Prostaglandin pathway protein immunolocalisation in amniotic epithelium, amniotic and chorionic fibroblasts, and decidual cells was not noticeably altered by inflammation. In chorionic trophoblasts, heterogeneous expression of PTGS2, PTGES, CBR1 and HPGD was seen (Figure 6A, B, E & G). In inflammatory leukocytes there was expression of PTGS2, AKR1C3, CBR1 and PTGES (Table 3 and Figure 6A, B, D & E). 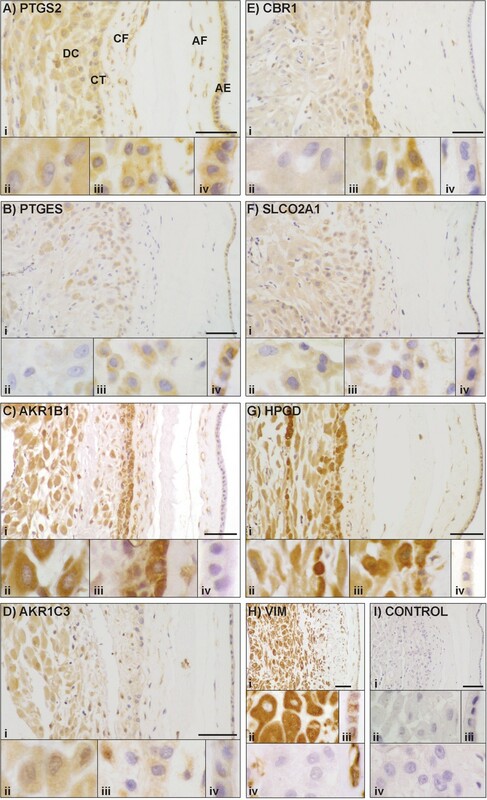 Immunohistochemical localisation of PG pathway proteins in gestational membranes with inflammatory infiltration. (A-I) Images show sections of membranes with chorionic fibroblasts (CF), infiltrating leukocytes (IL), chorionic trophoblast (CT) and decidual cells (DC). (I) Negative control without addition of primary antibody. Scale bar = 50 μm. As we have examined multiple members of the prostaglandin pathway in three uterine tissues, there is inevitably a degree of overlap with previous studies of prostaglandin pathway components. For descriptions of the immunolocalisation of prostaglandin pathway proteins, this overlap has been summarised in Table 3, from which it can be seen that we are now presenting novel evidence of uterine immunolocalisation for seven of the eight prostaglandin pathway proteins studied. Previous descriptions of prostaglandin pathway gene expression have focused largely on the cyclooxygenase/prostaglandin H2 synthase genes PTGS1 and PTGS2 (formerly Cox1 and Cox2). Not all previous observations can be reconciled with each other. In the placenta, there is evidence suggesting no change in PTGS1 expression with gestational age , and contrasting evidence of decreasing expression with increasing gestational age at labour . In gestational membranes, increasing gestational age has been associated with increased [26, 27], unchanged [27, 28], and decreased PTGS1 expression. Likewise, the incidence of labour has been associated with increased [26, 27] and unchanged [30–36]PTGS1 expression. In the placenta, the existing evidence suggests that there is no change in expression of PTGS2 with gestational age or clinical chorioamnionitis . In the gestational membranes, several studies have shown higher PTGS2 expression with increasing gestational age [26–29]. There is evidence supporting both increased PTGS2 expression following labour [26–28, 31–35] and no change with labour [20, 36, 37]. Information relating to intrauterine expression of other prostaglandin pathway genes is limited. Our previous work demonstrated expression of the 15 prostaglandin pathway genes in placenta, amnion and choriodecidua . In addition, PLA2G4A (phospholipase A2, group IVA (cytosolic, calcium-dependent)) expression has been identified in human placenta and gestational membranes , as has expression of PTGDS and HPGDS. In placenta and membranes, PTGES expression has shown no change with labour . Expression of AKR1B1, AKR1C3, HPGD and SLCO2A1 has been demonstrated in amnion and choriodecidua . Evidence has been presented in support of unchanged placental expression of HPGD in response to gestational age, labour and intrauterine infection [25, 40], but also in support of increased expression with gestational age . In choriodecidua, there is evidence for lower levels of HPGD mRNA in labour than not-in-labour [24, 37, 40, 42], with further reductions occurring in the presence of intrauterine infection . The human placenta, fetal membranes and decidua produce prostaglandins throughout pregnancy with a large increase at parturition, but the precise roles of these pleiotropic mediators are yet to be determined. The prostaglandin metabolic pathway consists of anabolic and catabolic components, as well as trans-membrane transporters (Figure 1). We have characterised prostaglandin pathway gene expression and protein localisation in placenta, amnion and choriodecidua from women delivered at different gestational ages with or without labour, induction and intrauterine inflammation. We have described novel protein localisation and gene expression patterns that increase our understanding of the roles of prostaglandins in human pregnancy and labour. The placenta is the interface between the maternal and fetal blood supplies, allowing nutrient and waste exchange across the thin syncytiotrophoblast layers of numerous highly vascularised fetal villi projecting directly into the placental pool of maternal blood. As the fetal tissues are allogeneic to the maternal tissues, there must be mechanisms at this interface to prevent a maternal immune response to the fetus. We have identified similar patterns of protein localisation in decidual cells and extravillous trophoblasts of the placental bed and syncytiotrophoblasts of placental villi. 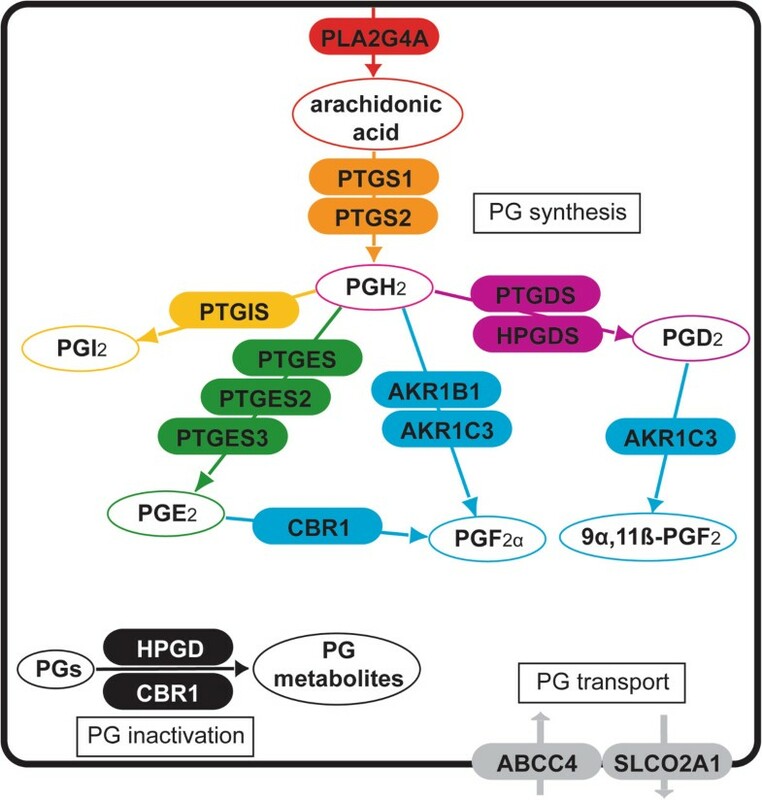 These cells all express AKR1B1, PTGS2, HPGD, PTGES, SLCO2A1, AKR1C3 and CBR1, thus having the capacity for PGF2 and PGE2 synthesis and PG uptake and degradation. Gene expression patterns described here and in our previous work  support these observations and we now describe the presence of PGD2, PGE2 and PGI2 synthases in the placenta. Comparisons of placental gene expression in different groups of women identified increasing HPGDS, AKR1C3 and ABCC4 with gestational age in the absence of labour, and higher PTGIS in labour than not-in-labour preterm. The fetal membranes consist of the fetal amnion and chorion and the attached maternal decidua, which together comprise a major structural element of the uterine tissues and have endocrine functions in pregnancy and parturition not yet fully elucidated . As in the placenta, the trophoblast and decidua are the interface between maternal and fetal tissues. Immunolocalisation of prostaglandin pathway proteins in chorionic trophoblast cells and adjacent decidua are similar to each other, and to some extent resemble placental patterns, with HPGD, AKR1B1, AKR1C3, CBR1, PTGS2 and SLCO2A1 expressed in choriodecidua. Unlike in placental cells, variable protein expression is evident in choriodecidua, with the immunolocalisation of PTGES in chorionic trophoblast but not decidua, and higher chorionic levels of CBR1, and decidual levels of AKR1C3. Prostaglandin gene expression changes in choriodecidua include increased AKR1C3 and PTGIS with gestational age and labour, with higher AKR1B1 in labour preterm, and higher AKR1C3 in labour at term compared with not-in-labour. In the region between the chorionic trophoblast and amniotic epithelium, fibroblasts express PTGS2, PGF2 synthases and HPGD, while the amniotic epithelium itself, which is known to be a source of PGE2 synthesis [43, 44], expresses PTGS2 and PTGES proteins, and also high levels of PTGS2, PTGES and PTGES3 mRNA. Both PTGS2 and PTGES are differentially expressed in amnion, with PTGS2 increasing with gestational age in the presence of labour, and PTGES decreasing as gestational age rises in the absence of labour, and displaying higher expression in labour than not-in-labour at term. Despite previous observations of increased levels of prostaglandins and their metabolites in amniotic fluid with labour [39, 45, 46], we did not observe a significant alteration in PTGS2 in amnion and choriodecidua with either preterm or term labour. Taken together, these expression patterns suggest distinct roles for prostaglandin metabolism in tissues at the maternal:fetal interface and in tissues within the fetal compartment. At the interface there is the ability to synthesise PGD2, PGE2, and PGF2, but these prostaglandins might be limited to autocrine or paracrine function by the co-expressed degradative complex of SLCO2A1 and HPGD, which is considered to be a barrier between the maternal and fetal prostaglandin systems [24, 47, 48]. These prostaglandins could participate in the immunomodulation of maternal leukocytes present in decidua, placental bed and maternal blood, to prevent rejection of the fetal tissues. PGE2 synthesised in the amnion and released into the amniotic fluid could influence fetal physiology, for example by inhibiting fetal breathing . The reduction in amniotic PTGES expression and amniotic fluid PGE2 with increasing gestational age might then allow lung movements to develop in sync with fetal maturation. It should, of course, be noted that PTGES is the only one of the three PGE2 synthases that displays this dependence on gestational age for amniotic expression. PTGES is also the only PGE2 synthase that shows higher expression in the amnion than in the other tissues. Furthermore, as amniotic expression of both SLCO2A1 and HPGD are some orders of magnitude lower than in placenta and choriodecidua, it suggests that there is sufficient degradation of the PGE2 that is released into the amniotic cavity in fetal tissues, such as the lung, to prevent accumulation in the amniotic fluid. In addition to gestational age and the incidence of labour, we investigated the correlation of prostaglandin gene expression with other characteristics. Duration of labour was associated with different expression changes in each of the tissues, with both upregulation and downregulation of prostaglandin genes. The only gene to be affected by both duration of labour and the presence or absence of labour was AKR1C3 in the choriodecidua. This suggests that regulation of some genes is associated with the process of labour, regardless of its duration, whereas others are affected by exposure to the prolonged stressful effects of labour. As we could not follow gene expression throughout labour, we cannot rule out that the differential regulation of these genes is a cause rather than an effect of the duration of labour. In a rarely quoted study involving >200 deliveries, Keski-Nisula et al. demonstrated that decidual inflammation is significantly more common in women in advanced labour compared to early labour, and concluded that the inflammatory changes are more likely to be a consequence of labour rather than its cause . Given the traumatic effects of labour on both mother and child, elucidating the true nature of this relationship could provide valuable information. We were very interested in evaluating the presence or absence of intrauterine inflammation. There has been a great deal of effort expended on establishing the causative relationship between intrauterine infection, inflammation and labour, particularly preterm labour. The premature activation of inflammatory pathways by intrauterine infection has been proposed as a major contributor to preterm labour [51, 52]. Amniotic fluid metabolomic profiles differ in women delivering preterm in the presence and absence of intra-amniotic infection and inflammation . We compared gene expression in a group of women with histological signs of inflammation with expression in a group of women matched for gestational age at delivery, and without substantial differences in other recorded variables, but with no signs of inflammation. To confirm the histological observations of inflammation, we measured the expression of three known inflammatory genes, finding significant upregulation of all three in amnion and choriodecidua samples from the INF group. Among the prostaglandin pathway genes, PTGS2 was upregulated with inflammation in both amnion and choriodecidua, whereas CBR1 and HPGD were downregulated in choriodecidua. In the placenta only one of the inflammatory control genes was upregulated, and none of the prostaglandin genes was affected by inflammation, but as the intrauterine inflammation was largely limited to chorioamnionitis/deciduitis, we cannot rule out that placentas affected by villitis, which show altered leukotriene synthesis , would also show prostaglandin pathway expression changes. The unique expression patterns of prostaglandin pathway and inflammatory control genes that we have observed suggest that in cases of uncomplicated spontaneous preterm labour, there is no underlying inflammatory expression profile. There must be an alternative mechanism for uterine activation in SPL in the absence of inflammation. In this regard it is worth mentioning that oxytocin, a strong uterotonic agent, stimulates PTGS2 expression in human myometrial cells through previously undescribed pathways such as NFAT (nuclear factor of activated T cells) . Although these results support the idea that labour usually occurs in the absence of inflammation, there is evidence that the presence of inflammation can be a trigger for labour, with [8, 12] or without [10, 12] signs of infection. This delivery mechanism can provide a response to intrauterine infections that can threaten the lives of mother and fetus. Tocolysis is not always an appropriate treatment, even for very early preterm labour, as the uterus can become a hostile environment. However, when infections can be overcome, and in instances of premature labour without infection and/or inflammation, there are great potential benefits to effective tocolysis. Our observation of different prostaglandin pathway expression profiles in preterm labour and inflammation could have implications for the choice of tocolytics used in different situations. Although elevation of PTGS2 in placenta and membranes affected by inflammation could be countered by selective PTGS2 inhibitors, PTGS2 is not upregulated with preterm labour in these tissues, although it is in myometrium . Better understanding of the roles of PTGS2 in the different uterine tissues in preterm and term labour with and without inflammation could clarify when PTGS2 inhibitors are most likely to be effective. We observed an increase in PTGS2 expression in the amnion with term versus preterm labour that has also been seen previously [31, 32, 55]. An increase in amniotic fluid IL1 (interleukin 1) with labour at term has been described , and could be responsible for the PTGS2 upregulation, although as with other observations in this field, there is contradictory evidence suggesting lower IL1 at term . Increased PTGS2 expression induced by cytokines, would explain the upregulation of PTGS2 in the inflamed membranes of chorioamnionitis. Limitations of this study include the numbers of samples in each of the groups; there is no enough data to correlate with previous preterm deliveries, hypertension, BMI, asthma, smoking and socioeconomic status of the women. Immunohistochemistry was used as a qualitative assay for only a subset of the prostaglandin pathway proteins, so that no quantitative data on protein levels were obtained. Another potential limitation is the lack of statistical correction for multiple comparisons, which could lead to type I errors of false positive identification of statistical significance. However, in order to avoid type II errors of rejection of true significance, we have presented the results of our statistical tests uncorrected, with the caveat that further studies are required before the changes that we have identified can be unequivocally confirmed. The principal aim of our research is to identify the causes of preterm labour, to enable reliable prediction of its occurrence and to facilitate its prevention by identifying biochemical pathways suitable for intervention. In light of considerable evidence linking prostaglandin function with uterine activation, we have undertaken a detailed analysis of prostaglandin pathway gene expression in human placenta, amnion and choriodecidua, identifying changes in association with gestational age, labour, inflammation and duration of labour, although there were no significant differences between spontaneous and induced labour at term. Inflammation provokes specific changes, unrelated to the presence of labour. The use of tocolytics should take into account these differences, in particular between uncomplicated spontaneous preterm labour and chorioamnionitis. Greater understanding of the different PG pathway changes in idiopathic and inflammation-associated preterm labour should facilitate the targeting of appropriate pharmacological intervention to these very different groups of women. We are grateful to research midwives Anne Duffner and Alison Kirby for obtaining consent from women at St Michael’s Hospital and organising the collection of samples. Dr Hana Al-Zamil also contributed to sample collection and processing. This work was supported by Wellbeing of Women [grant RG825]. The authors declare that they have no competing interest that could be perceived as prejudicing the impartiality of the research reported. MAF has a patent for methods for the regulation of the prostaglandin F synthase (PGFS) activity of AKR1B1 and uses thereof. RJP: experimentation, analysis and manuscript preparation; MAF provided reagents helped with the preparation of manuscript; ALB: design of study and preparation of manuscript.